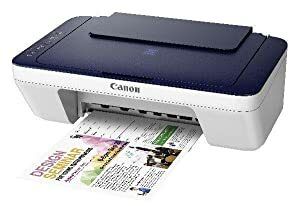 Buy Canon Pixma MG2577s All-in-One Inkjet Colour Printer (Blue/White) @ 32% Discount. Fine: Features Full-photolithography Inkjet Nozzle Engineering (FINE) with a patented print head firing ink droplets as small as 2pl. Hybrid Ink System: Combines dye ink for vivid colors and black pigment ink for sharp text. Print Documents and Web Pages Fast: Print documents and web pages with fast speeds of approx. 8.0 images per minute (ipm) for black and approx. 4.0 images per minute (ipm) for color. Scanning Resolution: Produce impressive scans up to 600 x 1200 dpi with vibrant 48-bit color depth. 4 Color Cartridge System: Integrates the FINE print head and ink into one compact unit for easy replacement. High Resolution: 4800 x 600 maximum color dpi produces incredible quality and detail in both your business documents and photos. Auto Power On: This convenient feature automatically powers up the printer whenever you send a photo or document to be printed. Special Filters: Have all sorts of fun with your images by adding new effects such as: Fish Eye, Miniature, Toy Camera, Soft Focus and Blur Background before you print. Full HD Movie Print: Full HD Movie Print software turns your favorite HD movie clips captured with compatible Canon EOS Digital SLRs, PowerShot digital cameras and VIXIA digital camcorders into beautiful prints. Get creative with this online service for every one of every age. Personalize your very own special occasion greeting cards, calendars, scrapbooks, paper crafts and more. Pixma MG2577S offers offer optional XL ink cartridges. This means getting genuine Canon quality ink at a higher volume, at a lower cost. The following cartridges are available for MG2577S. *Declared Yield value in accordance with ISO/IEC 24711. Values obtained by continuous printing. With the Canon Pixma MG2577s, you can print all types of documents quickly and with ease. The hybrid ink system helps combine dye ink for vivid colours and black pigment for sharp text, making this a highly efficient printer. With Full-photolithography Inkjet Nozzle Engineering (FINE), this printer brings out true-to-life colours with every print. Also, you can use this device to scan documents up to 600 x 1200 dpi with vibrant 48-bit color depth. With an auto power on function, it is always ready to get you prints at the push of a buttom. 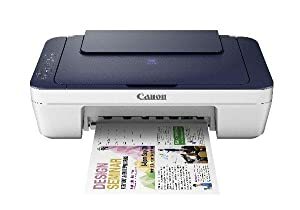 Whether it is an important document or fun projects for children, you can rely on this printer to scan and print instantly. The Canon Pixma MG2577s All-in-One InkJet Printer also comes with a My Image Garden software, making printing your photos fun and easy. 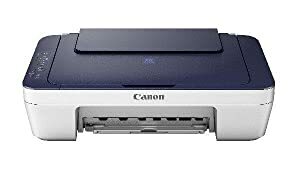 Best Cheap Deals For Canon Printer & Scanner, Grab Cheap Canon Pixma MG2577s All-in-One Inkjet Colour Printer (Blue/White) Online.